In Eustis Florida, I had the great pleasure of warming up the crowd, speaking, entertaining and singing at a Tea Party rally in which Florida Governor Rick Scott debuted his 2011 Budget. 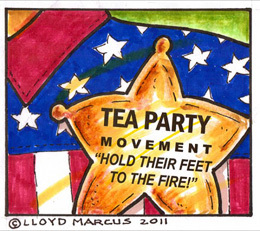 It was a historic event solidifying the power and influence of the Tea Party Movement. It felt like a family reunion with Tea Party groups from all over Florida. Kudos to Gov Scott for having the courage to lead and "do the right thing." There is a great 50s movie titled, Abandon Ship! A luxury liner sinks leaving 27 survivors in a life boat designed for a capacity of nine. The captain dies leaving the executive officer in charge. Land is 1200 miles away. The new captain's responsibility is to save as many lives as possible. Thus, he is forced to make extremely painful and devastatingly difficult decisions as to who is considered "dead weight." As a little boy, I marveled at the captain's will, leadership and courage. Unlike liberal wimps, real men have the backbone to "do what needs to be done." True leadership is often a lonely endeavor requiring one to fly high above the status quo. Eagles fly alone. While the consequences are nowhere near as severe as in the movie, Gov Chris Christie and Gov Rick Scott are displaying courageous responsible leadership by "doing what needs to be done." Rest assured, no one will die or truly suffer from their budget cuts. We Tea Party patriots truly appreciate them. God bless.